14000 - Sidewinder White C4 LED, Red, Blue, IR LEDs. Includes 2 1/2AA1/2 alkaline batteries. Blister Packaged Coyote. 14001 - Sidewinder White C4 LED, Red, Blue, IR LEDs. Includes 2 1/2AA1/2 alkaline batteries. Blister Packaged Green. High impact super-tough nylon case offers exceptional durability and weather resistance. All openings are O-ring sealed. Available in Coyote and OD Green. Unbreakable polycarbonate lens with scratch-resistant coating. Gasket sealed. Dimming-Strobe and LED selection functions. Design does not require the operator to access separate switching locations on the device. Rubber dome actuator & 4 position pull-to-turn locking rotary selector knob with IR tactile indicator provides easy operation even when wearing heavy gloves. Two (2) 1/2AA1/2 size alkaline cells provide fast replacement with readily available batteries. Lithium 1/2AA1/2 cells allow extended operation in extreme temperature environments (-40F to 150F). Tactile battery polarity indication on body allows replacement of cells in dark environment. Most models meet applicable European Community Directives. 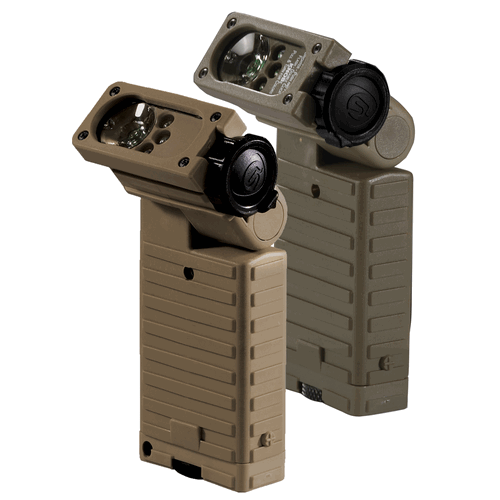 Streamlight warrants its Sidewinder (excepting batteries) will be free from manufacturing defects under normal use for 12 months after purchase. During the warranty period, at its sole discretion, Streamlight will repair or replace any defective part or product. Push-button switch enables/disables selected lighting source starting at low intensity and progressing to the brightest intensity. O-ring and gasket sealed openings for waterproof operation.